In the business for almost 40 years, Matt Roberts has seen a few revolutions in dentistry. Roberts is the founder of CMR Dental Lab, a high-end cosmetic reconstructive laboratory in Idaho Falls specializing in large, complex aesthetic and reconstructive cases. 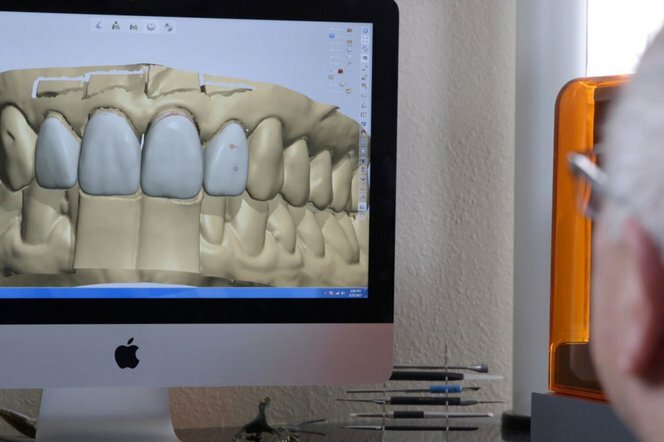 Over the past ten years Roberts has gradually shifted his lab to digitally aided CAD/CAM technologies in order to tap into the potential in digital dentistry. A common procedure before final restorations is to create a diagnostic wax-up. In this process, planned restorations are developed in wax on a diagnostic cast to determine optimal clinical and laboratory procedures necessary to achieve the desired aesthetics and function. Read on for more details on how a firm specializing in large, complex aesthetic and reconstructive cases was able replace manual tasks with 3D printing. CMR Dental has managed to simplify workflows to save time and costs, and deliver superior products to their clients. Collect the anatomical data of a patient’s dentition from an intraoral scan, or by scanning a stone model from a physical impression taken by the dentist. Design the ideal aesthetics in dental CAD software. Mill the restorations out of wax. Place the milled restorations on the stone model. Form a silicone matrix from the restoration. This silicone matrix is the final product for the dentist. They can fill it with bis-acryl resin and cure temporaries in the shape of the lab’s wax-up design, directly in the patient’s mouth. The doctor and patient then inspect the results and, if necessary, make minor adjustments per the patient’s request. Between the slow cycle time for milling the wax restorations and the painstaking handiwork required from skilled technicians, it's a time-consuming process, and one prone to error. Wax restorations can break all too easily during the process of forming and removing the silicone matrix, necessitating a lengthy rework. Comparison of the traditional and digital workflows. Stereolithography (SLA) 3D printing has significantly simplified CMR’s diagnostic wax-up workflow. Now, technicians can digitally match the restorations with the model and directly 3D print the combined solid model. This is a substantially cheaper and faster process than creating stone models and milling from wax. 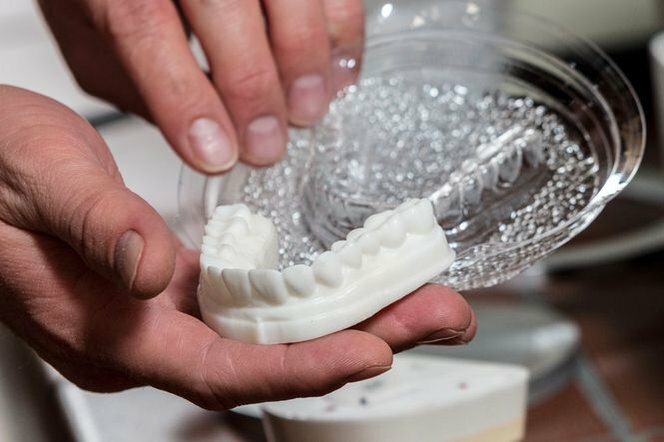 3D printed models can also be used to create a thermoform tray that is essentially the same as the silicone matrix for the dentist, but more efficient for the lab. Requires less labor and eliminates mistakes and reworks. Cuts turnaround time from 2-3 days to a few hours. Lowers material and machine costs. Allows the lab to safely ship aesthetically pleasing 3D printed education models directly to dentists. CMR started with a single Form 2 3D printer, but soon grew to four units to meet the volume of jobs coming in. At the Form 2’s accessible price point, Matt could invest in additional units with confidence that it’ll be paid off fairly quickly. With multiple printers the lab is able to take on even more cases, and has the flexibility to start a new print job at any time. Technicians design the diagnostic wax-ups at different times of the day, and now they can run multiple prints in parallel and even overnight. Technicians at CMR now design the restorations and digitally match them with the prepared model. Now, CMR Dental 3D prints all of their diagnostic wax-ups on four Form 2 SLA 3D printers. Printing models also makes adjustments very simple if a patient requires any changes. Instead of having to add wax or composite, a technician can just go back to the digital design, slightly move the teeth, and then reprint. This thermoform tray is the final product for the dentist. They can fill it with bis-acryl resin and cure temporaries in the shape of the lab’s wax-up design, directly in the patient’s mouth. 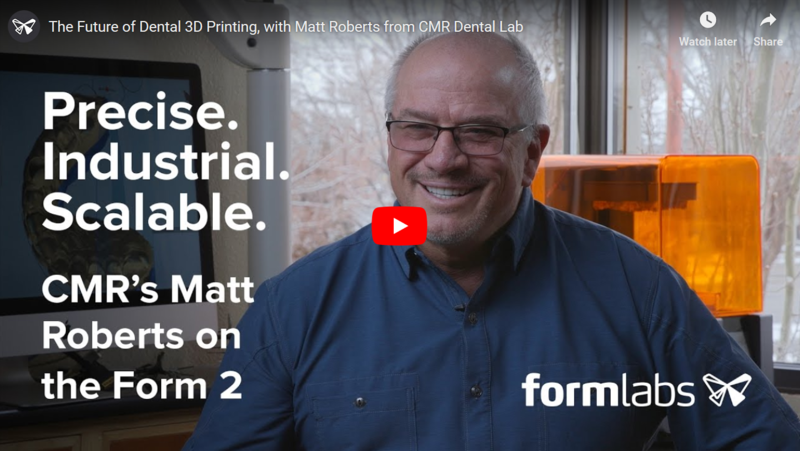 Using Formlabs 3D printers, CMR Dental has increased the productivity of their technicians by 100%, cut costs by 90% and shortened the lead time for diagnostic wax-ups by 80%. 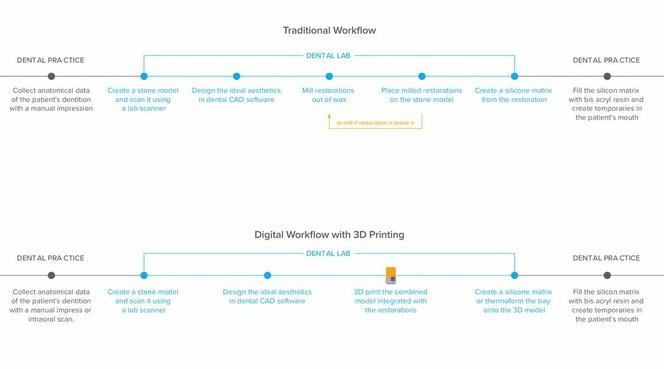 We encourage you to learn more about how Formlabs is working with dentists around the world.